LEP readers, come closer to hear about the wellies! 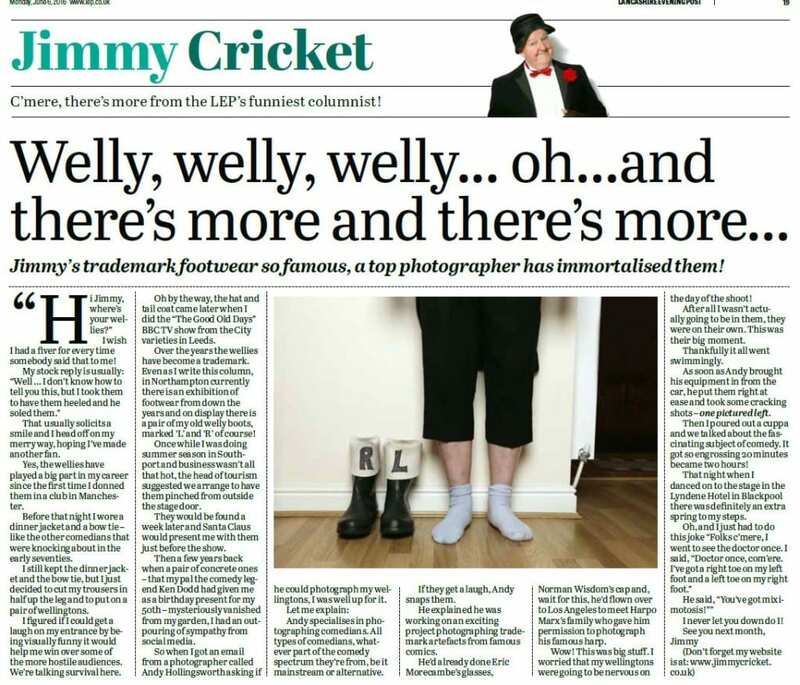 Jimmy Cricket has told readers of his newspaper column how he came to end up with his trademark wellingtons – and why they were recently the subject of a photo shoot. The Northern Irish entertainer is famous for wearing the green wellies – marked with the letters R and L – on the wrong feet during his acts. 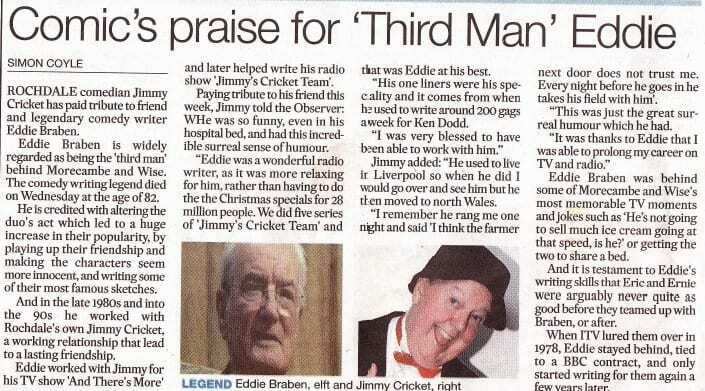 Jimmy, 70, said in the Lancashire Evening Post (LEP) that he first donned them in a Manchester club in an effort to “get a laugh on my entrance by being visually funny… to help me win over some of the more hostile audiences”. He added that an old pair of his boots were currently on display at a footwear exhibition in Nottingham. 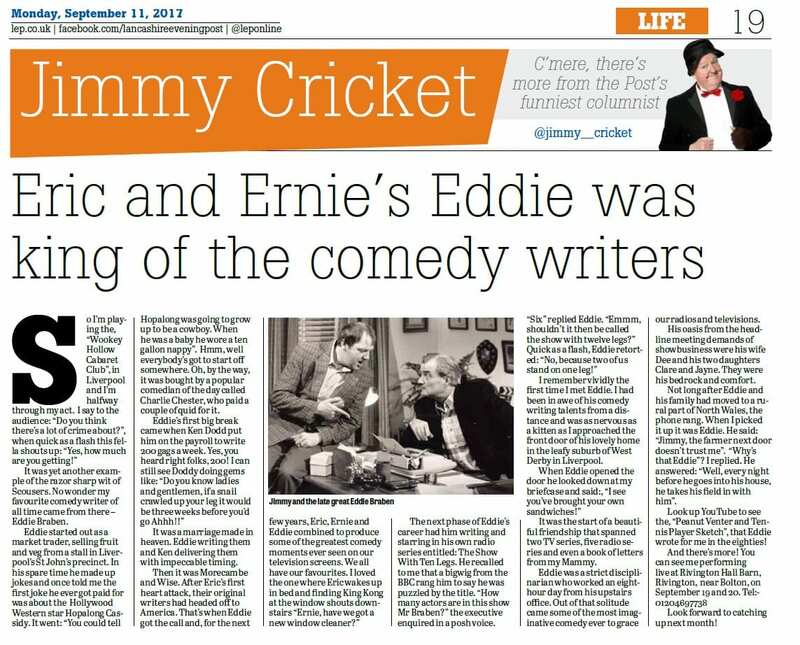 Jimmy also told of the time a pair of concrete wellingtons presented to him by fellow funnyman Ken Dodd were stolen from his garden in Rochdale (they still haven’t been found). And he also related the story of how recently they were the focus of a photo shoot by Andy Hollingworth, a photographer who specialises in comedy. 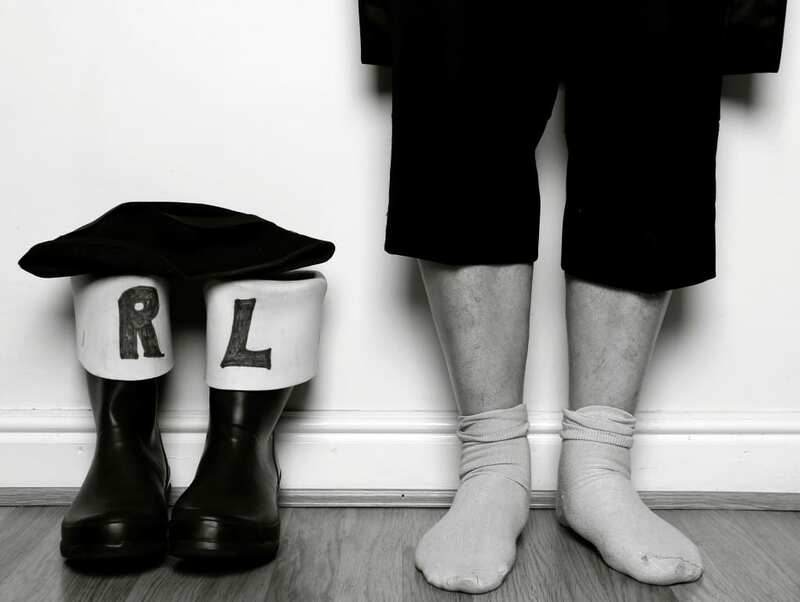 Andy wanted to capture an image of Jimmy’s wellies for an exciting project, which involves him photographing iconic artefacts linked to famous comedians – either from mainstream or alternative comedy. He has already photographed Eric Morecambe’s glasses, Norman Wisdom’s cap, Mr Bean’s teddy, Alan Carr’s glasses and he even flew over to Los Angeles to meet Harpo Marx’s family, who gave him permission to photograph his famous harp. Famous wellingtons get their own photo shoot! Jimmy Cricket’s famous trademark wellies were recently the subject of a photo shoot! It followed a request from Andy Hollingworth, a photographer who specialises in comedy. Andy wanted to capture an image of Jimmy’s wellies (above, in black and white) for an exciting project, which involves him photographing iconic artefacts linked to famous comedians – either from mainstream or alternative comedy. Well-known Northern Irish entertainer Jimmy, 70, is famous for wearing the green wellington boots – marked with the letters R and L – on the wrong feet during his acts. Andy has already photographed Eric Morecambe’s glasses, Norman Wisdom’s cap, Mr Bean’s teddy, Alan Carr’s glasses and he even flew over to Los Angeles to meet Harpo Marx’s family, who gave him permission to photograph his famous harp. 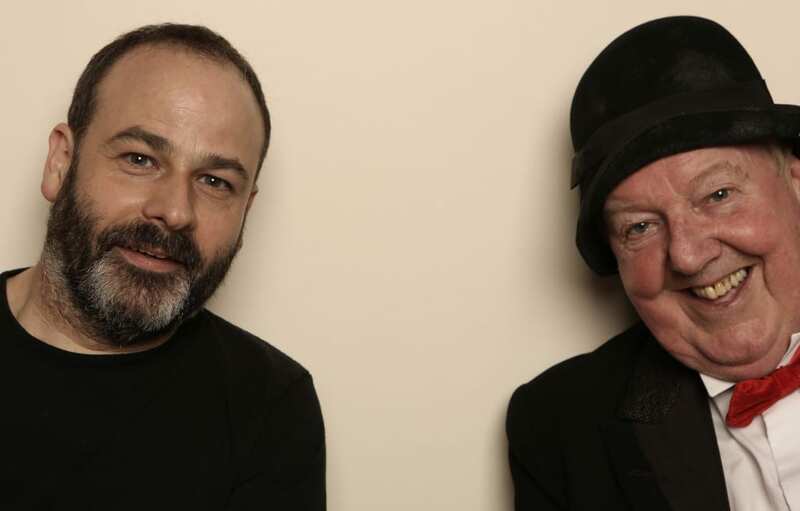 Andy met Jimmy at his house in Rochdale to snap the famous wellies – and the two (pictured below) had a great chat about comedy, which lasted longer than expected!